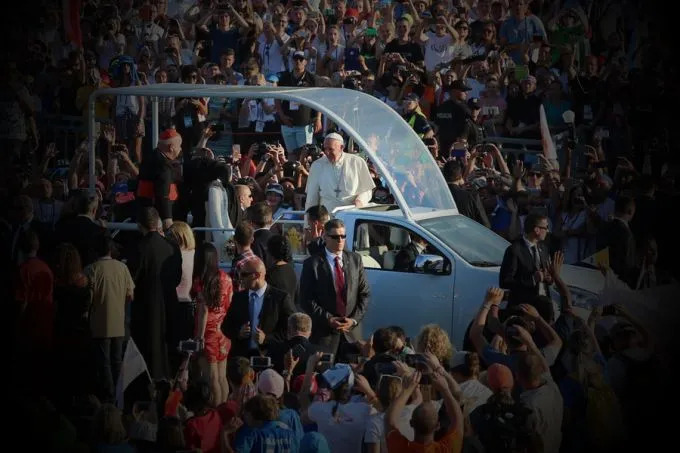 Krakow, Poland, Jul 30, 2016 / 12:30 pm (CNA/EWTN News).- Pope Francis challenged massive crowds of young people at World Youth Day's final vigil to step away from the “sofa” of comfort and convenience, and respond to Christ's call to transform a suffering world. Saturday's WYD vigil marks the end of Pope Francis' second to last day of his July 27-31 trip to Poland for the international youth event. The address was delivered after hearing the testimonies of three young people, including a young woman named Rand who described the daily horrors which the people in her home country of Syria experience. The gathering of so many young people from countries torn by conflict, war, and other atrocities makes it so that the sufferings experienced by young people in these regions “are no longer anonymous, something we read about in the papers,” the Pope said. “They have a name, they have a face, they have a story, they are close at hand,” he said referring to the suffering which young people like Rand have experienced, coming from war-torn Syria. The extent of these situations cannot be appreciated by viewing them through a cell phone screen or computer, he said. The Pope also acknowledged the testimonies of struggle and inner conflict delivered by the two other young people, Natalia – a former fashion magazine journalist – and Miguel – a former drug addict. “Both of you are a living sign of what God’s mercy wants to accomplish in us,” he said. Pope Francis stressed that now is not the time to denounce those fighting or to tear people down. “We have no desire to conquer hatred with more hatred, violence with more violence, terror with more terror,” he said. At this point, the Pope invited everyone to join hands for a moment of silent prayer, which he said afterwords reminded him of the scene of the Apostles on the day of Pentecost. “Picturing them can help us come to appreciate all that God dreams of accomplishing in our lives, in us and with us,” he said. On that day, the disciples huddled behind locked doors, paralyzed by the fear of persecution, the Pope recounted. “Thinking that in this world, in our cities and our communities, there is no longer any room to grow, to dream, to create, to gaze at new horizons – in a word to live – is one of the worst things that can happen to us in life,” he said. Pope Francis warned against a more dangerous kind of paralysis, which he described as “sofa-happiness” – in other words, the paralysis of confusing happiness with the sense of comfort, freeing us up to escape into the world of videogames and the computer, all the while keeping us at home with the illusion of safety. “That is probably the most harmful and insidious form of paralysis, since little by little, without even realizing it, we start to nod off, to grow drowsy and dull while others – perhaps more alert than we are, but not necessarily better – decide our future for us,” he said. “But when we opt for ease and convenience, for confusing happiness with consumption, then we end up paying a high price indeed: we lose our freedom,” he said. He told young people to take the path of the “craziness” of our God, by which he means caring for those in need, be they neighbors, prisoners, friends, refugees, or migrants. It is not a time for young “couch potatoes,” the Pope said, but for protagonists of history. “History today calls us to defend our dignity and not to let others decide our future,” he said. “Jesus is inviting you, calling you, to leave your mark on life, to leave a mark on history, your own and that of many others as well,” he said.